Party, meeting or other occasion being planned in Hämeenlinna area? Welcome to the Könnölä Old Byre! 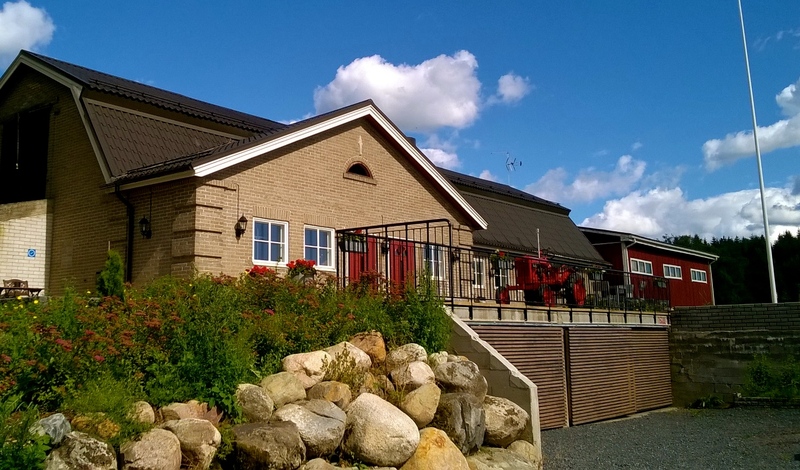 Könnölä´s former, 1928 built cowshed has been renovated in 2015 into a modern, stunning banquet and conference room. Floor area in the Old Byre is over 300 square meters, so the space provides an elegant setting for up to 180 person events. In Old Byre all your guests fit in one open plan space, with a lot of space for the buffet serving and dance floor with band too. Banquet space decor is a simple and elegant: white, gray and brown tones combined with surfaces with high quality materials. Chairs, tables and other furniture are dark. It is possible to create a variety of moods with very versatile planned lighting. While renovating we wanted to maintain something old, however, so that the space meets the modern needs. The windows and the front terrace opens to a calm field landscape and a beautifully designed garden area. The sun shines on the terrace all day long! Close by you´ll find a good-sized parking area and a separate area for smokers. Flagpole allows flagging to honor your party. The banquet room is easy to reach with a wheelchair via ramp. The whole room is on one level with no stairs. Also the toilet for the handicapped is provided. Catering you can organize yourself or use the catering provider of your choice. We can recommend some catering operators, ask for more information! We have got no alcohol licenses (no alcohol for sale) so you can bring the desired drinks for your celebration or event. Old Byre has a well-equipped kitchen and a bar counter with a high cold beverage cabinet. Tables and chairs for 156 people, additional tables and chairs for 40! Pictures of The Old Byre here! Please feel free to contact Pirkko and make an appointment or ask for more information. You should definitely come and visit the Old Byre yourself and feel the atmosphere! See additional photos on our Facebook-page. We warmly welcome you to celebrate in Könnölä!